It’s time for another blog anatomy lesson. This one isn’t trying to top the Anatomy of a Cave one previously mentioned, just to show you that you never know what you’ll see out in the world. Today we went with our friends (ya know the ones with the flower painting that looked like the cave) to an apple orchard for the afternoon. When we got back to their house they mentioned a problem they had. Here’s a photo – do you know what this problem is? Well, at least we know their problem has been circumcized. I wonder how the mohel nipped this tip? Now here’s the question: Is it a black “mushroom” or a white “mushroom?” It’s got a black tip but a white base. Can’t decide whether it’s black or white? Oh my god, it’s Michael Jackson’s “mushroom”! JL: I think we’ll have to ask H & J since it’s at their house. They best be able to locate where it came from . 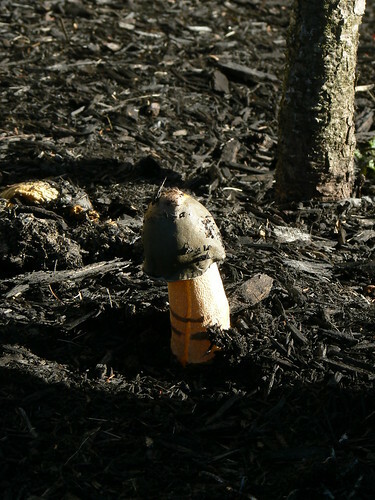 . . or at least they should know that Michael Jackson’s mushroom is lurking out front!